Jewish students are being put off from applying to certain universities because of claims of anti-Semitism. The outgoing National Chair of Labour Students, Melantha Chittenden has told Newsbeat that her own party's leadership is to blame. She claims there'd be less anti-Semitism on campuses if the party leadership had been tougher. Labour says it is "committed to challenging and campaigning against it in all its forms." Anti-Semitism is prejudice against Jewish people. It resurfaced in the Labour Party in 2016 when the former Labour Mayor of London, Ken Livingstone, defended a Labour MP accused of posting anti-Semitic comments on Facebook. Critics say the party's leader, Jeremy Corbyn, has not handled the issue well. Melantha Chittenden spoke to Newsbeat as she was leaving her role with Labour Students meaning she no longer has to publicly toe the party line. "It's stopping Jewish students from being able to go to the campuses they want to or even engage in activities they want to on campus," she says. "That's very problematic and I don't believe Jeremy Corbyn wants that to be happening. He needs to challenge the problem head-on." Newsbeat visited Manchester to speak to young Jewish sixth formers about their experiences. Sam says he ruled out one of his top university choices because of what happened there in the past. "That university had incidents in the past of anti-Semitism and my parents said to me they wouldn't feel comfortable with me going, so I didn't apply." Another pupil, Charlotte, told us: "I'm very conscious of it when I make my university applications. "If I am involved in an anti-Semitic incident I want there to be people who can help me through it." 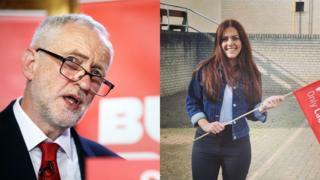 In 2016 three vice presidents of the National Union of Students accused their then president, Malia Bouattia, of "anti-Semitic rhetoric" which she denied. A range of Jewish groups have told Newsbeat Labour has a problem with party members expressing anti-Semitic views. In its latest report, the Community Security Trust (CST), a charity that works with Jewish community organisations, recorded 1,382 anti-Semitic incidents in 2017 - the highest total ever. Dave Rich from CST says he knows of problems that have arisen when student campaigns connected to Israel have taken place. Critics of the Israeli government claim it has used tactics that are disproportionately violent against Palestinian protestors angry about issues such as ownership of land, freedom of movement and basic human rights. "They [the campaigns] can create an atmosphere where Jewish students feel incredibly uncomfortable and those people who do have anti-Semitic attitudes feel confident to express them." Karen Pollock, the chief executive of the Holocaust Educational Trust says "there is anti-Semitism on campus" and told us about some recent examples. "At a university in 2018, there was a Facebook group chat saying: 'Six million Jews ain't enough'" - a reference to the number of people who were killed during the holocaust. "There was another one where some t-shirts were handed out at a fresher's week saying the Holocaust was a good time," says Karen. "It's shocking that someone would write this stuff and it's shocking that someone would distribute it." When asked if she thought there could be a link between this and allegations of anti-Semitism in Labour she said: "I wouldn't be surprised if there is some relation". Labour Students has been working with Jewish groups, such as the Union of Jewish Students (UJS), to educate its members about anti-Semitism and says it's had some real success. "I think that if you look at the situation with anti-Semitism in the Labour Party, it is clear there is a link - you are seeing more anti-Semitic incidents," according to Josh Holt from the UJS. "That's because it's more permissible. You can get away with acting in this way." We contacted Labour in May when we first started to investigate this to provide someone to interview, but they declined. "Labour's new General Secretary Jennie Formby has made it her first priority to speed up and strengthen our procedures and to develop a programme of political education to create deeper awareness and understanding about all forms of anti-Semitism."